Wanhao Duplicator I3 3D Printer – Printing a Glow In The Dark Rocket! Please visit www.DIY3DTech.com for more information on this and many other projects! 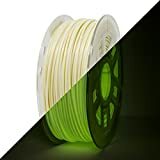 As in this episode we will be printing a Classic Rocket from Thingiverse with Glow in the dark PLA filament. However does it work out? Well check out the video!